WD Backup does not see my drive as a backup target. Local PC Security, Anti Virus, Malware protection and or End Point Protection software may need to be configured to Allow WD Backup. 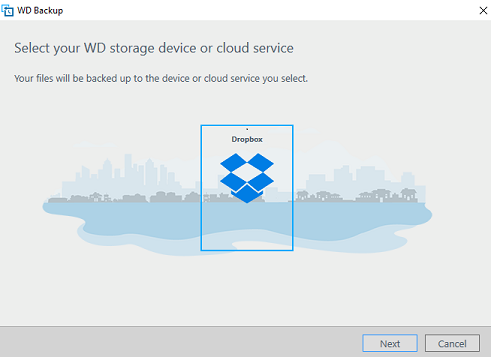 The WD Backup Drive Helper process will start running when the WD Backup program is started. If the process does not start when WD Backup is opened, WD Backup will not see the drive. Check your local PC anti virus, malware and or end point protection software to ensure WD Backup is allowed and not blocked. For assistance, pleased contact your software vendor or refer to their technical user manuals or disable the software while troubleshooting.. Ensure the WD Drive is connected directly to the computer and NOT connected to a USB Hub. Ensure the computer can see and access the drive. Ensure the drive is supported by WD Backup. Download and Install the latest version of WD Backup. Download and Install WD Drive Utilities. Verify the WD Backup Drive Helper services starts when WD Backup is opened. Open WD Backup software from the Start Menu or from the icon tray. Verify if the WD Backup Drive Helper process changes to Running when WD Backup is started. to force the service to start at the time of system boot. If the solutions above do not resolve the issue of WD Backup not recognizing the drive, Acronis True Image WD Edition Software can be used or use the built-in backup utility within the Windows operating system instead. Click Here to download Acronis True Image WD Edition Software and refer to Answer ID 3689 Performing a backup using Acronis True Image WD Edition Software to configure a backup job.